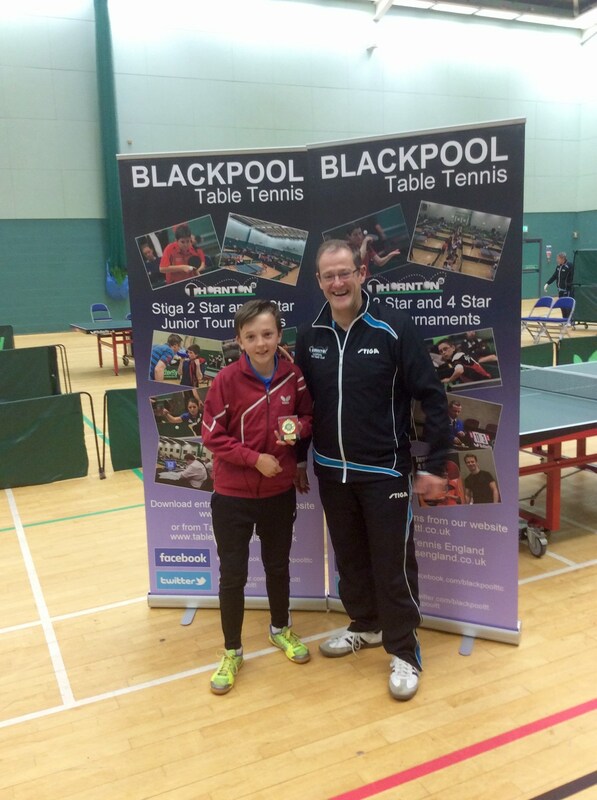 Sam Lowe represented the Premier Club in the Blackpool 2 Star on Sunday 22nd October. This was Sam’s first tournament of the season, his last in the under 13’s age group. His first event of the day was the under 15’s. In his group of four he won one of his three matches, losing to Ben McDonald and Gene McGhee, before defeating Luke Mitchell. This meant he entered the plate event and Sam won his next two matches before losing in the semi-final. In the under 13’s, in the afternoon, Sam had a difficult group and he again won one and lost two matches. So he was once again in the plate competition. From then on Sam won his next two matches to reach the final where he met Luke Mitchell for the second time. With both players playing better than in the morning it was a much better match. Sam took a 2-0 lead, coming back from 8-4 down in the second set, before Luke took the third set. In the fourth, Sam showed some of the attacking shots he possesses to take a narrow lead. He held on to take the set 11-9. Overall Sam ended the day winning 7 matches and losing 5 and it was a good start to the season. Scarborough Table Tennis League is a table tennis league affiliated to Table Tennis England.